Flowers have bloomed, bees are buzzing, and the birds are singing their happy tunes. That can mean only one thing: spring has sprung! 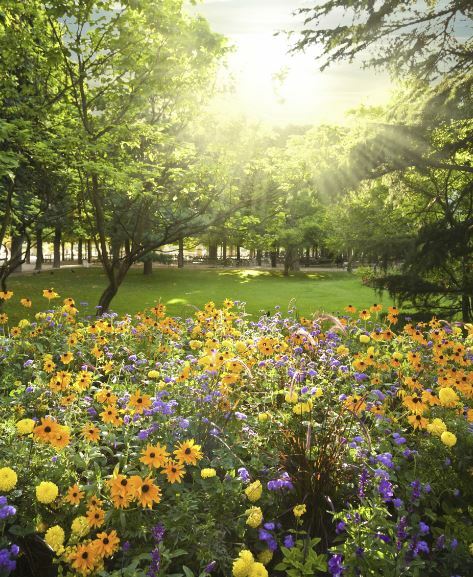 A season of growth and renewal, spring is especially beautiful because of the gorgeous gardens. Several of Howard Hanna’s Luxury Homes of Distinction boast absolutely magnificent gardens, beautifully showcased each spring. 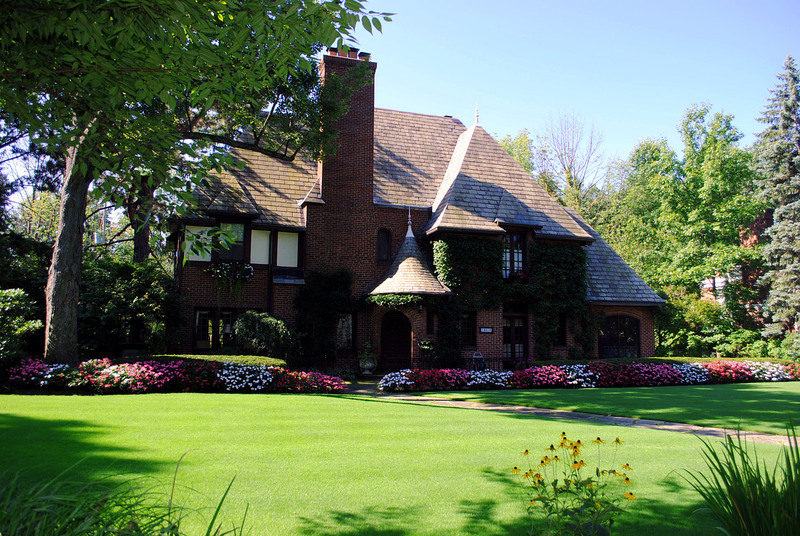 Explore these gorgeous gardens, maybe imagining owning such a beauty. And remember to always stop and smell the roses! 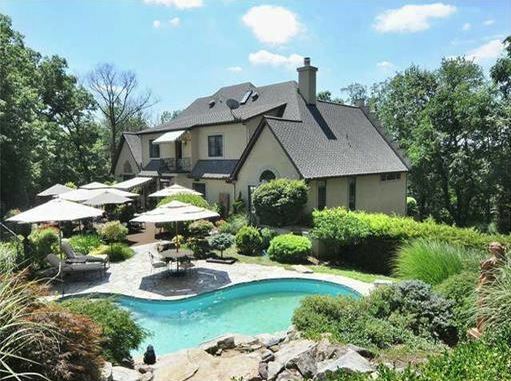 This European inspired home boasts panoramic views and museum quality detail throughout. The exquisite two-story foyer with iron and glass front doors welcomes you with a massive, Venetian chandelier. 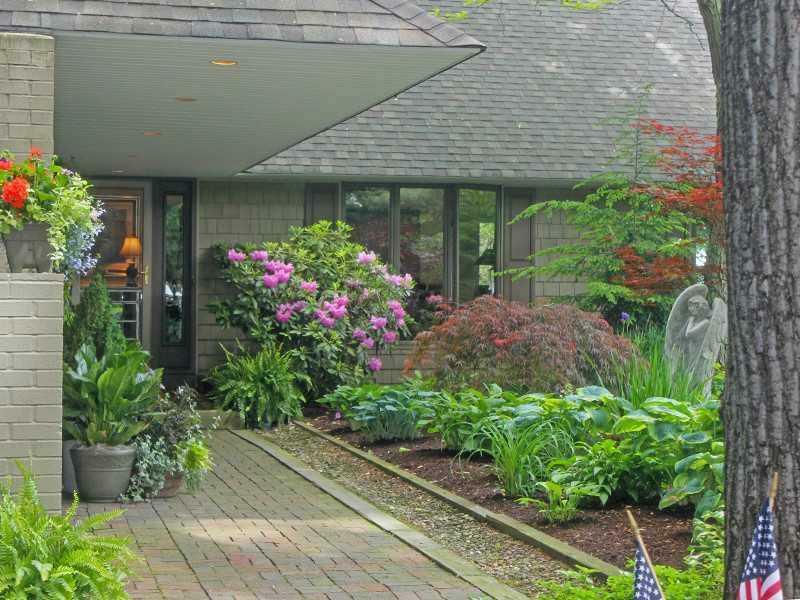 The gourmet kitchen provides access to a luxurious patio that offers breath-taking views of the Allegheny River Valley, as well as a pool with a gorgeous waterfall. The main-floor master bedroom is spacious with a striking bath. Two additional bedrooms are on the upper level, each open with stunning light fixtures. The sunken living room with marble floors and custom, extra-tall windows is extremely inviting. The finished lower level provides a bonus suite with a kitchenette that is ideal for hosting overnight guests. With a private lane and stately features, this home is built to impress. A beautifully appointed home, set on a private, 4.7-acre lakefront property, provides residents with access to their very own private beach. This meticulously maintained Ranch offers three-and-a-half baths and four bedrooms, including a spacious master suite. A kitchen includes high-end appliances, abundant counter space, bay window and access to a nice sunroom. The open dining room and living room feature beamed vaulted ceiling, built-ins and access to the back yard. A family room is well lit by a skylight feature and kept cozy by a fireplace. Panoramic views of Lake Erie can be enjoyed from nearly every room in the house, and from the expansive deck area with a six-person hot tub and a screened-in gazebo. Two two-car garages offer plenty of storage space for vehicles and any lake essentials. 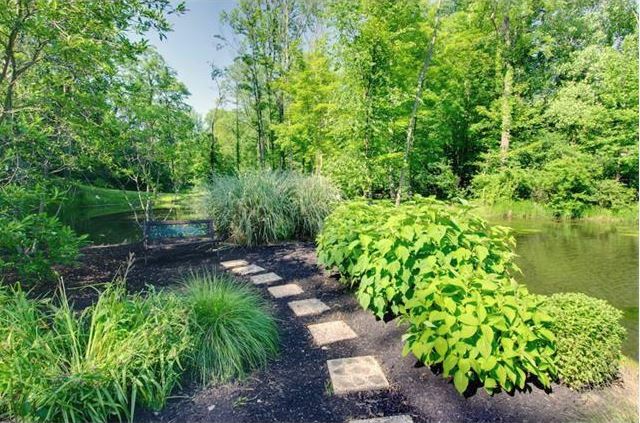 Beautifully updated, this T. Longwell custom-built home is set on over four acres of rolling terrain, complete with gardens and a charming pond. With over 6,000 square feet of living space, this sophisticated home includes five bedrooms and five-and-a-half baths. The marble-tiled foyer features an elegant staircase with a landing that overlooks the great room with fireplace, wet bar and French doors to the deck. The kitchen is updated and has vaulted ceilings, granite, walk-in pantry, island, stainless steel appliances and an eat-in area with access to the deck. The main level also boasts a living room with adjoining sunroom, paneled library and a master suite with ample closet space and an impressive bath. A finished recreation room, additional private suite and heated garage add to the luxury of this home. This picturesque three-acre estate is Provincial perfection with stately front doors that reveal the elegant foyer, which faces the eye-catching stacked stone fireplace in the two-story great room. Large windows in every main-level space allow views of the lush greenery. The living room and dining room exude old-world charm, while the gourmet kitchen displays stunning color and gorgeous marble counters. The two-story great room with wall of windows opens to the secluded rear patio, surrounded by plantings and a tranquil fountain, transitioning to the in-ground pool beyond. The upper level hosts four bedrooms, including the vaulted master suite with spa bath, adjacent to a private gym. The finished lower level has an extravagant wine cellar and movie theater for added entertaining delight. 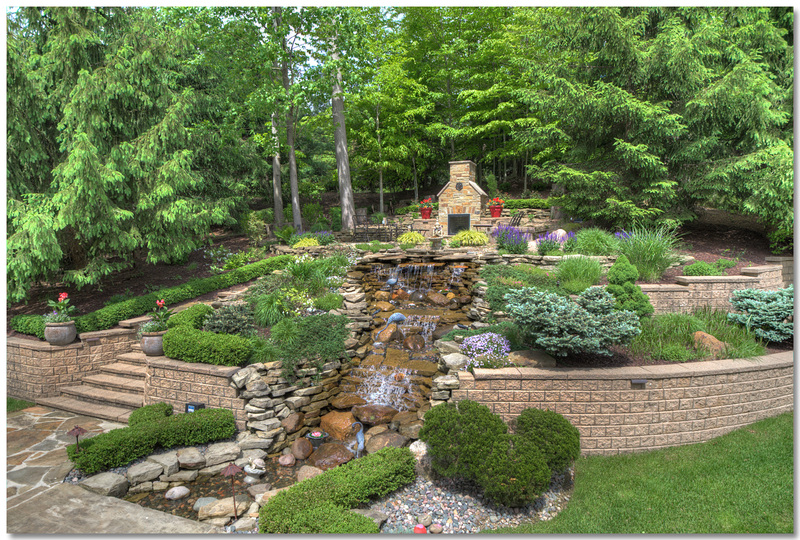 This two-acre estate set on a cul-de-sac is absolutely breathtaking with a waterfall, rock garden, lotus pond and outdoor fireplace. The grand foyer with barreled ceiling opens into the living room with a marble fireplace and wet bar, and the dining room with gorgeous chandelier. The great room has an open fireplace and leads to the gourmet kitchen with granite, stainless steel appliances, island, and an eat-in area with access to the deck. The master suite has a marble fireplace, walk-in closets, balcony, study, walk-in marble shower, dual vanities and jetted tub. The lower level boasts a temperature-controlled wine cellar, wet bar, fireplace, kitchen, exercise and home theater rooms, bedroom suite and an office. 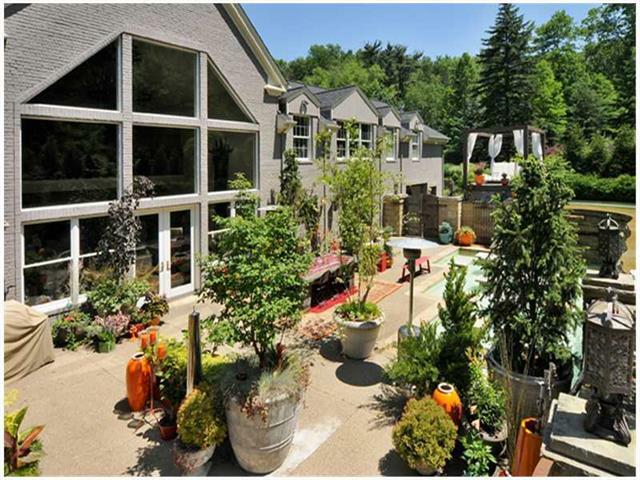 With an expansive deck, hot tub and four-car garage, this home has it all. This New York-like brownstone sits on a double lot on one of Shadyside’s most prestigious streets. Old-world charm, ornate woodwork, leaded glass and spacious rooms make this townhome truly one-of-a-kind. Natural light streams in through the plentiful windows, offering a light and airy atmosphere. With six bedrooms, two-and-a-half bathrooms and a full basement, this home provides plenty of living space. Gleaming hardwood and interior brick speak to the gorgeously preserved architecture of this home. Beautiful fireplaces are found in both the living room and formal dining room, as well as in several of the upstairs bedrooms. An elegant, wood staircase allows access to all three levels. 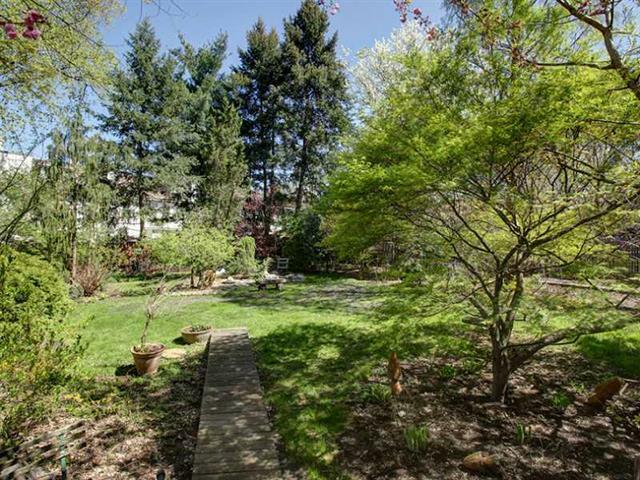 The large backyard is a botanist’s dream, with plenty of room for a garage, too! This exquisitely detailed brick Tudor is absolutely stunning with seven bedrooms, four full baths and two half-baths. The home has gorgeous architectural details throughout, including carved wood, leaded windows, hardwood floors, three fireplaces and a slate roof. The foyer opens into the spacious living and dining rooms. The eat-in kitchen has granite counters and stainless steel appliances, is updated, and opens to the fabulous landscaped yard and patio. A paneled library and screened-in porch complete the main level, while four bedrooms and three full baths are found on the upper level. The master suite has a fireplace and large dressing room. A third-floor suite offers three additional bedrooms and a full bath. The lower level has been completely reconstructed with a home theater and built-ins. This beautiful home was inspired by Frank Lloyd Wright and features 600 tons of sedimentary stone quarried from eastern Oklahoma. This home truly captures the essence of integrating the outdoors with the interior and preserving the integrity of the surrounding landscape. Constructed to commercial standards with 30,000 pieces of block to support its steel frame, this extraordinary house was built according to Wright’s “Golden Rule.” True to the Wright concept of repetition, the custom-designed fixtures, furniture and cherry wood cabinets are consistent throughout the house. The screened-in porch is built on a true cantilever held up by beams of solid concrete. Of the 600 tons of stone in the house, not one was cut or reshaped. 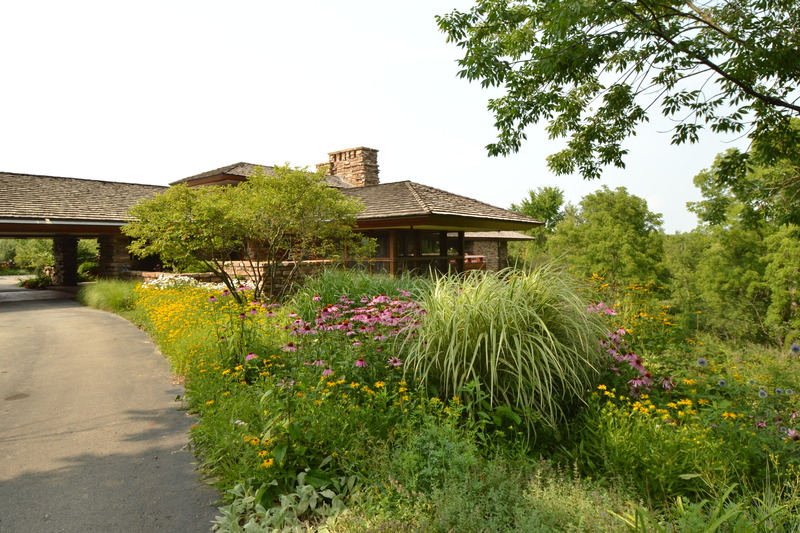 Surrounded by 15 acres of rolling hills and overlooking Fleming Creek, this home is a masterpiece. Understated elegance meets warmth and sophistication in this stunning contemporary home, designed for living and entertaining. Situated on six acres of park-like grounds, there are many indoor and outdoor spaces that function in perfect harmony. The main level features an open floor plan with large rooms showcasing beautiful views. The formal living room has dramatic cantilevered stairs leading up to the master suite with cathedral ceiling, fireplace, wet bar, and spa-like bath. 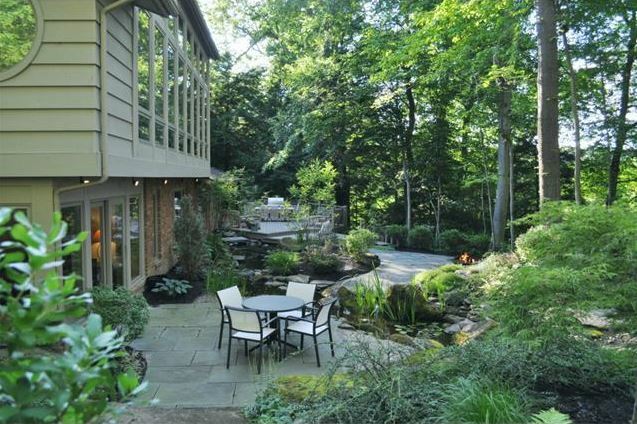 The gourmet eat-in kitchen has spectacular high-end appliances and overlooks Griswolf Creek. Outdoor living areas include a multi-level deck, a sunken hot tub, outdoor shower, kitchen, stream with waterfalls and a koi pond. Renovations throughout were completed in 2012, so this house is updated, modern and a true delight.